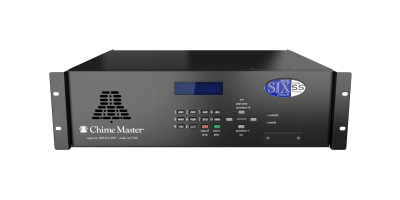 The Chime Master Six-SS is a digital electronic carillon. Included in the Six-SS are the essential carillon music and bell ringing that every church should have. This product is a stand-alone professional audio component, designed and built specifically for the purpose of automatic church bell ringing. It is completely solid state with no moving parts. All church bell ringing and music is stored as digital audio in reliable FLASH memory. Included weekly scheduling features provide flawless performance year after year without intervention for most congregations. Additional flexibility can be added with the optional Premium Management software for automated schedule changes. Experienced church musicians have arranged and performed each hymn specifically for the musical bell voice you choose. Swinging bells, pealing bells, clock striking and prayer bells are also included at no extra cost. This page was last modified on 1 March 2018, at 11:48.